It’s that time….farewell to the old year, let’s bring on the new one! I received the traditional email from Jetpack with my stats – but it had a bunch of weird things listed as “most popular pages.” Like….your shopping cart. LOL. So I dug deeper and pulled out what the stats say you guys liked most. Note: Later in the post are the new toys I tried out in 2015 that I had the most fun with! This blog was viewed over 1,380,130 times in 2015. No wonder it feels like things are hopping. How wild is this graph of views? Most popular blog posts….did you see them? My personal favorite things I made this year that aren’t listed above. dmc4042* —>made me the gift in the picture. WOW! 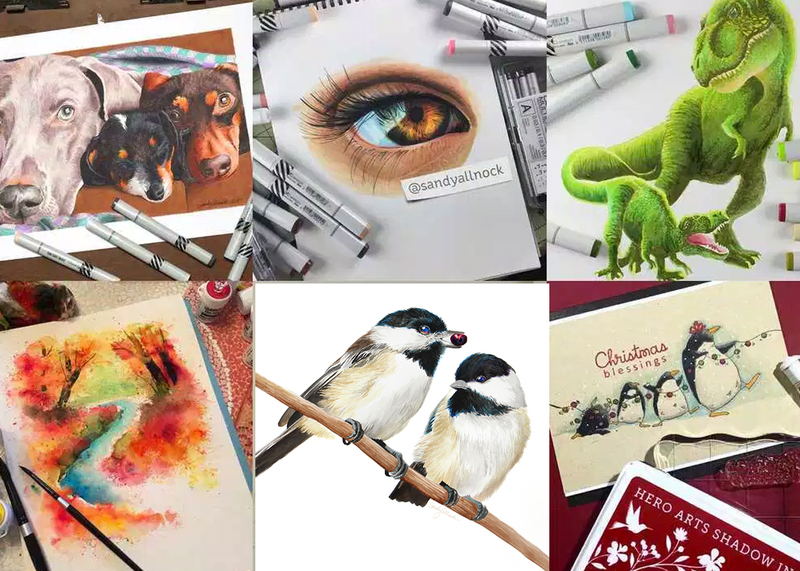 Makes me wish I had picked a better cover image for the chickadee painting in the middle! ha. These aren’t all items that came out only in 2015, but I bought them/started using them this year. *affiliate links used. Read more here. Silver brushes. They make everything watercolor SING. Love me a good 2, 4, 6, 8 and a flat 1″. Holbein watercolors. In my attempts to see the difference between student grade and ‘spensive supplies, I discovered that Holbeins go on….like buttah. Kind of the same way I discovered years ago that Copics go on like buttah compared to my little waterbased pens. Brusho. Egads where was I before I knew about these? Thank you Lydia for enabling me. Dr Ph Martins Hydrus watercolors. The beautiful colors combined with the fact that they dry permanent? Oh yeah. And my storage for them is in a rainbow on a shelf above my desk, which makes me happy just to look at them. Uh huh. The hex chart. It makes everything Copic better, doesn’t it? Pepin coloring books. So relaxing, so beautiful….on drawing paper and printed in halftones. Hope they come out with more in 2016! Papers! Arches Rough paper. We fell in love. And Yupo, we’ll keep getting to know each other! Gold! Pastes, paints, sprays, pens. I can finally use shiny things, and I am loving it! Europe. That trip changed me forever! Periscope. Yeah baby! First crafter over 2.5 mil hearts. And an article in CHA’s magazine too! Bible journalling. Just a few baby steps in that direction, but enjoying it. Also my faithbooking posts here on the blog and YT! Toastmasters – in the fall contest, I made it to the finals! And stepped out to be in the church drama too. 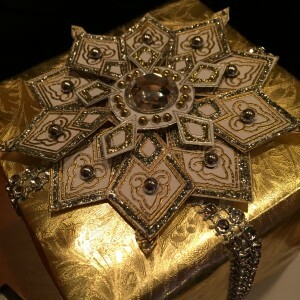 Classes around the country – exhausting but such fun to meet so many wonderful crafters! New logo! It pays to hire a pro. The full reveal will come soon. Society 6 – new store for selling prints, y’all have been asking! The end of OWH. Not the best kind of rocking, but it’s changing my life to end as much as it did to start! Getting posted HERE by Tim. I still get tons of people coming from that link! Crazy! Last but definitely not least: God’s blessings. I simply can’t believe He loves me so much. Still waiting for happy mail. 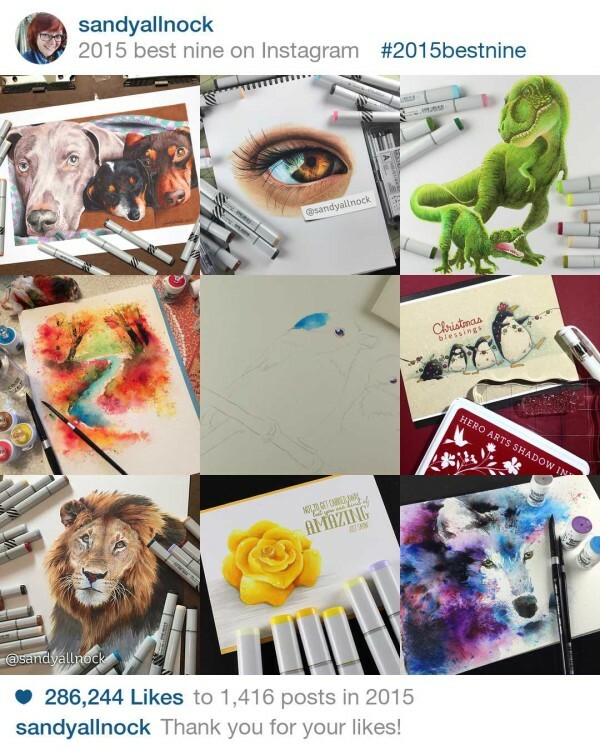 Thanks for all the creative inspiration in 2015! Looking forward to seeing what 2016 brings! Happy New Year and God Bless! Happy New Year. Thanks for all the wonderful videos. Happy New Year Sandy!!! Thank you for your lists, those are great; and thank you so very much for sharing your talents and the little piece of you and your humor with us throughout the year. You and all the artists who are so willing to take time to do videos help us grow and keep this wonderful craft of ours growing, and we so appreciate it immensely!!!! I can believe it.I’ve had a rocky end of year.In case you may be wondering where I went,My mom’s ended up with double walking pneumonia mid December and was on life support.It completely jerked the carpet from under my feet.With every ounce of prayers said in my body she made it home Christmas day.She’s very weak but mending.I’ve been helping her to regain her STRENGTH.I still believe your teachings was the greatest crafty thing that happened to me this year and look forward to a long teaching 2016 with you.Sometimes your periscope would put a smile on my face thru this.So for that I thank you from my heart.I pray you have a Safe,and Very Happy New Year.I will be back to heart you soon.,hehehe.Val or Valchic. I have really enjoyed your post this past year and learned a lot. Thank you for sharing your talent with us. Happy New Year, Sandy and have a blessed 2016. Happy New Year, Sandy, and thanks for all the videos, blogs, postings you share with us. Just wanted to say that I asked at JoAnn Etc. how the adult coloring books were going. The manager said they can’t keep them in stock. Sandy, I so enjoyed this post! Thank you for sharing tirelessly all year, especially to self-taught (or more so YT taught!) like myself. Your emails are a highlight of my day and I know there will always be interesting and inspiring content. Thanks again for sharing a blessed year – it’s wonderful to hear someone as talented as yourself give honor to the Lord. I pray He will continue to bless you in 2016! ‘Finding’ you has been a highlight of my 2015! Your TALENT is amazing, your JOYFULNESS is contagious, your HEART is huge, and your willingness to enable is LEGEND! And I am going to share this post so it will be on my timeline so I can go back and click on the links whenever I want or need to glean all your wonderful insights, tips and FUN. Wishing you a BLESSED new year! Sandy, thanks so much for all the inspiration you have given, I went back and re-watched a few of your video’s yesterday, just for learning some new things. I’m not an artist, I’m a medical professional, but as my son has pointed out “You HAVE to do something creative every day–it is who you are!” But it is true–folks like yourself, Jennifer, Kathy, Laura has inspired me to embrace being creative. Some of my clients are also “artists”, some not. But many have commented they see me over any other practitioner because I think outside the box, can figure out their issues AND talk about something they also love–ART! One client told me she feels that because I am creative and an artist, I am a much better practitioner. Now only if my tax guy would allow me to write off my art supplies as “educational and business expenses”. I even have a few of my clients doing daily “coloring” as part of their exercise programs. I really appreciate all you do to promote art, teach us new stuff and help inspire us to do so. I hope you have a simply awesome New Year–and yes, I enjoy all your “furry” family member photos–we had indoor cats for 30 years, now we have been blessed with caring for “God’s cat garden”, the bunch of feral cats in my neighborhood, whom we have neutered all through the TNR program and continue to feed and care for them. We are all God’s creatures! Sandy, you have challenged me so much this year. Working with copies! Happy New Year and can’t wait to see what you bring to the table! Sandy, Thank you for continuing to inspire me and so many others. I hope 2016 is filled with many, many blessings for you. I am so glad that I discovered you and ALL your talent – I learn something new each time I watch you. Thanks for all the time you give to us – Happy New Year Sandy! Happy New Year, Sandy! I can’t wait to see what 2016 has in store for you! Happy New Year Sandy! It’s been fun learning from you this year, and I look forward to learning and seeing more in 2016!!! A great wrap up post. The inside outside card was a great one, but so much that you do is. Thanks for sharing all that you do. Wishing you an even better 2016!! What a year you have had! That graph says volumes! I have tremendously enjoyed your posts, videos, and periscopes. You are a versatile and talented artist, and along with that you care and share so much. Thank you for 2015, and I’ll see you in 2016 for more! Thank you for all of the inspiration Sandy! Thank you for this post. I will take my time looking through it. Looking forward to seeing what you will share in 2016. Have a very Happy New Year. Thank you so much for entertaining and inspiring us all year. I loved your gold class. Thanks to you I also discovered that colouring with coloured pencils is so much easier with ultra sharp points. I don’t have the fancy sharpener that you have, but I bought this one: http://www.saa.co.uk/long-point-pencil-lead-sharpener.html this summer and it works like a charm. I can achieve a sharp point without the lead breaking off. Wishing you a wonderful and creative 2016! 2015 was good so now onto 2016! I love this list! Thank you for sharing! Happy New Year! Sandy have a great 2016. Can’t wait to see what you have in store. My 2016 is already busy and it’s not even here yet! Thanks for all the sharing and caring. Life has been good to you.